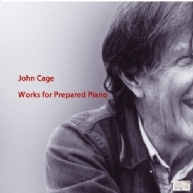 John Cage was a student of Henry Cowell and Arnold Schönberg and made use of innovations of both of his teachers, promptly integrating them into his own creativity – and turning them into something completely different. He adopted Henry Cowell's idea of altering the sound of a piano by interfering with the strings, thereby expanding the instrument's range of expression to a downright undreamed of extent. And as for Schönberg's twelve-tone system, Cage playfully extended it to a 25-tone system, only to eventually throw off all chains, wishing to experiment with numerous other kinds of music. Bacchanale was written in 1938, when Cage was asked to accompany the dancer Syvilla Fort on the piano. With the aim of creating the impression of a percussion ensemble playing, he prepared the instrument accordingly: and that's how it all began. This double album is a compilation of works for prepared piano written between 1938 and 1952, demonstrating an immense range of sound options. And Markus Hinterhäuser knows how to deal with them all, from rhythmically complex pieces to minute sound gradations, handling Cage's music with his innate intensity and enthusiasm.